Dragon NFXS goggles are small-framed goggles that redefine industry standards with a patented, frameless technology engineered by Dragon to provide the widest and clearest field of vision. The flexible, dual Lexan, anti-fog treated lens pairs perfectly with the armored venting, giving you a pristine view of the mountain side you're about to carve. With a hypoallergenic microfleece lining, there's no limits with these goggles for anyone. Need a pair prescription Dragon goggles for your adventures in the mountains? You've come to the perfect place. The SportRx opticians will craft custom goggle inserts for your Dragon NFX ski goggles and snowboard goggles. 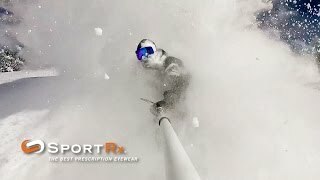 You'll be sure to see with the best vision possible when you order your Dragon NFX ski goggles or prescription goggles from a SportRx optician!